Get Motion to your images. 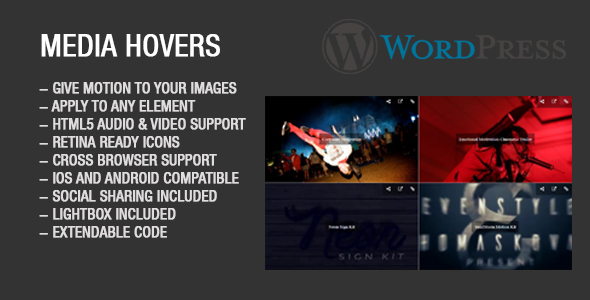 Media Hovers is a responsive HTML5 plugin which plays audio and video on hover. It can be applied to any element. Just specify thumbnail and audio or video file and turn it into your hover. Media Hovers also supports lightbox mode where images and videos can be viewed in larger mode. Lightbox can also contain Youtube videos, Vimeo videos, or any custom iframe. Using wordpress admin, upload and configure your images with audio and video, and use shortcode in any page or post to display. 2. This plugin uses fancybox so make sure you dont use other fancybox versions in your page for compatibility issues.